Living mainly in South, Central and West Africa and some areas of the Middle East and Southwest Asia, the elegant and nocturnal caracal favors a dry savannah environment consisting of wooded scrubland. The name “caracal” is Turkish and means “black ear” which is somewhat confusing considering the caracal’s ears are not entirely black. The reason for this name could be that juvenile caracal’s ears are black but then change color into adulthood. Although the caracal is not a large animal (a typical adult weighs only 35 to 40 pounds and is around 20 inches high and 40 inches long), it is incredibly powerful, an amazing climber and jumper and is able to stalk and kill prey much larger than itself. For example, it will kill antelope, gazelle and springbok. So skilled a hunter is the caracal that it can even kill very large snakes. In fact, an adult caracal that was kept in a zoo once killed a large cobra snaked that had entered into its enclosure. 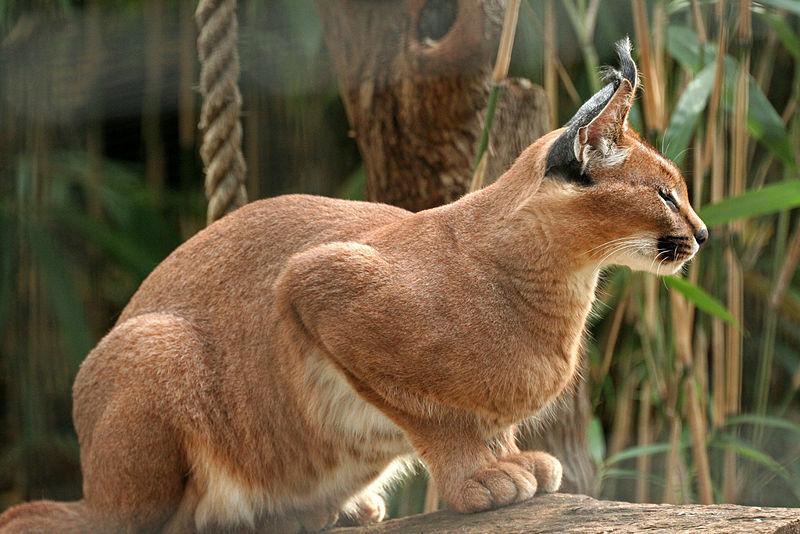 Caracals themselves are very often preyed upon by larger cats such as lions and other animals (eg. hyenas) – that being said, their main predator is humans. Like a typical feline, the caracal is a fussy eater and will leave behind the internal organs of its prey. It will also pluck the fur from its larger prey and only eat the meat. Unlike other cats, the caracal’s eyes do not contract into circles. Instead, they form slits. In addition, they have the unique feature of having hind legs, which are much longer than their front legs. 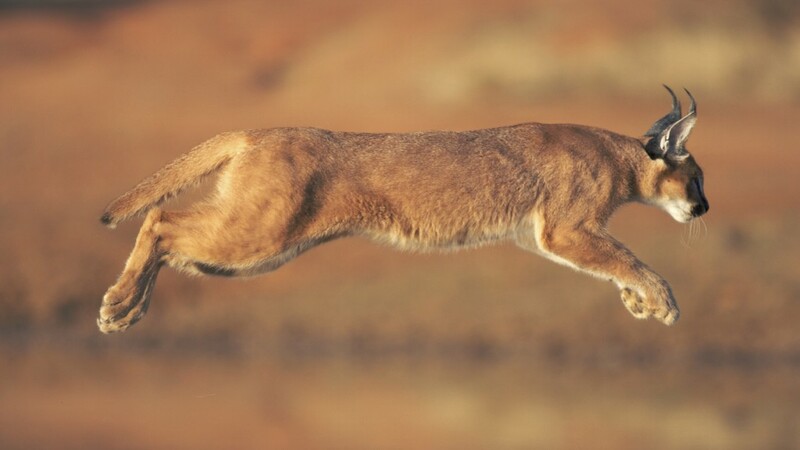 In years gone by, in countries such as Iran and India, caracals were trained as bird hunters due to their excellent ability to catch and kill low flying birds. Unfortunately, the caracal is still today killed for hunting livestock on farms and is a target for its attractive coat and meat.